My paint brush has gotten a work out the last few weeks. I finally finished my laundry sewing room. with natural, ivory and black accents. 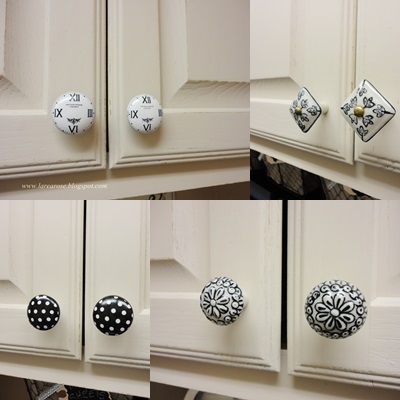 Now after painting all the cabinets and adding door pulls in different designs. next to a pull down ironing center and corner storage. The tall cabinet is a laundry shoot from the second floor. I have used paper printed copies of clock canvas sheets. I love clocks and here it speaks, time to iron!! LOL ya right. No really, I love to iron!! with Wanda from Roses in Winter on etsy. This area makes ironing so much better. and was created by a friend in the 80's. and I will share this how to in another post. On top the fridge I keep a clothespin basket. embellished with homespun toile fabric, buttons and bead trim. I have everything handy for easy use. from the ironing board door. I'll also share this in another post. I have an inspiration board. and a chalkboard stick up by Martha Stewart. You can find these at Staples Office supply. also gifted to me in my wonderful swap from Roses in Winter. This is another quilt block also from my swap. perfect for my new room. I placed a book caddy with graphics on the front of each panel. These are from the Graphics Fairy. Above the sewing counter I added a faux candle chandelier. To this I added bead garland from a sale at Hobby Lobby. It took 3 garlands and the extra was used to top the candles. Notice in this pic the ribbon valance created for the top of the lace valance. I did this to let in more light and not cover the window over the lace. and a dress form pin cushion too. also a gift in my swap. I'll be sharing more of the journal in another post. It's just too wonderful, it needs a post of it's own. my friend Marie from Dolls by Marie Antoinette on etsy. sent me this darling paper doll. She is perfect in this room. Behind this door at the end of the room, is the hot water tank. grape arbor many years ago. I redesigned it with vintage sewing treasures. I added a different set of pulls to each. in stripes of naturals, ivory, tan and black. I created the gathered skirt doubling the size of the counter length and even got a little fancy with the hemstitch. And under the counter is this storage. This laundry and sewing room is like an extension of my studio. It's cozy and nice to work in. Now it's another project to cross off the list. Thank you for stopping by to view my makeover. Wishing you a great week and Happy Creating.